This bar has been crafted from Madagascan cacao and sugar. This simplicity lets you taste the natural flavour of the cacao. From the first bite, you are met with a sharpness, with bright berries and citrus at the front. MIA stands for ‘Made in Africa’, an acronym that neatly sums up everything this maker stands for. The team behind MIA believes that there is truly exceptional food and drink being crafted in Africa from locally sourced ingredients. The team also believes in making delicious and unique food fairly, and that the food is produced in such a way as to give greater benefit back to the communities from which it comes, and which feels as good as it tastes. Madagascar has a rich heritage of cacao growing, and an ever increasing number of artisans are choosing to make cacao on the island too. 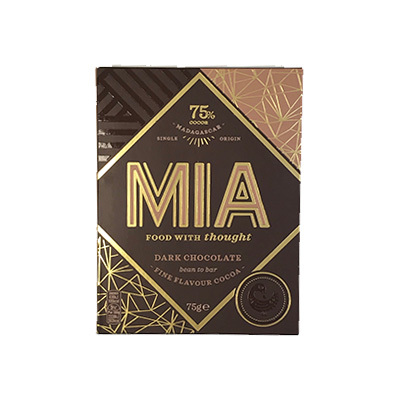 Bars made on Madagascar are routinely named amongst the best in the world, and so the arrival of MIA’s single origin chocolate bars had us particularly excited. This bar has been crafted from Madagascan cacao and sugar. This simplicity lets you taste the natural flavour of the cacao. The cacao used in this bar is grown in the north west of the island, in the Sambirano Valley. It is made by a team of makers at a local factory. This approach, crafting at origin, means that the local economy benefits not only from the sale of the cacao itself, but also from the skills, infrastructure and sale of the bars. From the first bite, you are met with a sharpness, with bright berries and citrus at the front. As it melts, this sharpness abates and transforms into a richer chocolate finish.